The only draw back to being a filmmaker is that you never really get to experience the film the way an outsider does. I’m always at awe when I experience a film that touches me. Being a writer/director, I become far too close to experience the film the way others would. I guess that’s the price you pay for being the one who offers to tell the story. Although I feel I totally understand the feelings and sensations I have created on screen, it is fair to say my vision and experience becomes progressively tainted and slanted, frame by frame, as I try to shut out my own memory bank of shooting, directing, editing the film, an experience that equates to thousands of playbacks in my head. I guess like any profession, when we stand too close, we simply cannot absorb the real picture. I have always said I would love to have someone invent a pill that film makers can take so that they can purge all information, all details, all back stories from their brain so they too can sit in a theatre and experience their work the way a stranger will see. The pill doesn’t exist. And I will continue to make films regardless. But today was like taking that pill. Since making our 115 minute director’s cut , we have made a theatrical cut, edited by the talented Sandra Torres and the gracious guidance of Splice Inc. in Hollywood. 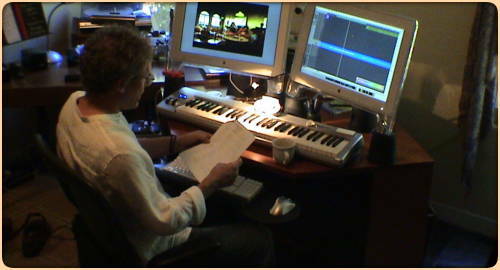 The new 90 minute version of Cages is blessed with complete original music score by Roger Bourland. Today I sat in Roger’s studio and he shared with me his newest creations for the film. It transported me onto a rollercoaster that I had never rode before. I felt new emotions and had spontaneous thoughts that I’d never imagined in the past. His music took me on a journey to which I was unfamiliar with the road it would travel. I even cried. May be it was the day I was having, maybe it was the scene… Maybe it was in sheer gratitude for having such a talented artist contribute to the collaborative efforts of this simple story about the human condition. Today I was able to see Cages for the first time. I had taken that pill. In this scene, the grandfather, Tan (Mako), and his blind grandson Jonah go to the songbird competition to prepare and find the right spot to place their bird. Earlier, Tan tells Jonah that it’s a “gut feeling” where to place the bird. So you’ll see Jonah “looking” around for the right place to put his bird. Throughout this scene, there is a cacophonous sound of birds over the music. Lovely! Thanks for sharing this. It’s amazing how music can infuse all kinds of unexpected emotional content into a montage like this. P.S. – Sorry to hear that Mako passed away recently. I’d always liked him in various episodes of M*A*S*H* and of course Pacific Overtures.